I hold my stress in my shoulders/neck/upper back. Those muscles feel so tight! I stretch it all the time but it never seems to get any better! Let's take a look at the muscles involved, why they hurt, and what to do about it. The actual muscles involved with this type of pain will depend on many factors, including overall health, posture, occupation, daily activities, etc. There are dozens of muscles involved with this pain pattern, large and tiny, superficial and deep. In reality they are all so interconnected that you can’t just isolate a few of them and ignore the rest, but for explanation purposes, that’s exactly what we’ll do. A few of the more obvious muscles involved are the rhomboids, the trapezius, and the levator scapula. A huge majority of the activities we participate in result in some degree of full body flexion (fetal position). For example, sitting at a computer, even with the best postural intentions, usually quickly degrades to shoulders rolling forward, the neck leaning forward, and the head tilting back to compensate for the forward lean of the neck. 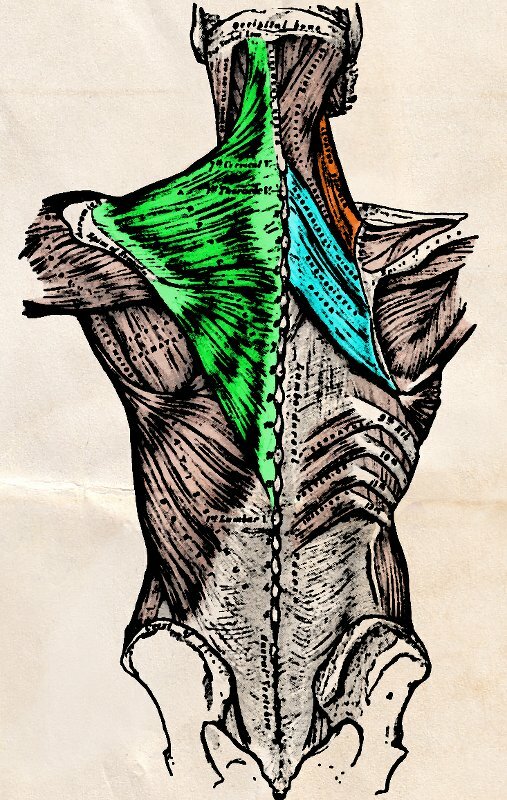 If we ignore the complete and total interconnectedness of all things and focus on just one muscle, we can see that the rhomboids contract and shorten to pull the shoulders back (retraction). And, in that case, the opposite action with the shoulders moving forward (protraction) causes the rhomboids to be… Long! And so you see that the muscles we stretch so much to help them feel better are already overstretched! They are pulled thin and the pain you are feeling is the muscles screaming, "Hold on tight or we're going to tear!" No wonder it hurts, they're doing everything they can to get your attention. Unfortunately, most of us misinterpret the message. I’m not saying you shouldn’t stretch, I’m just saying that you might be stretching the wrong areas. So the next time your upper back and the back of your neck are sore, try stretching the muscles in the front of your chest, neck and shoulders instead. I’ll get to more specifics in a future post (this one is getting too long already), but the basics are: chest open, shoulders back, neck up. And ALWAYS keep it comfortable. If you stretch to the point of pain you will teach your body that the position you are in is unsafe. It will lock down and guard against going that far next time.